This is the very first proper cheesecake on my blog..I'm very excited to share that I've made a cheesecake after overpowering my fear of baking a cheesecake. I've followed a recipe of my fellow food blogger Not Out Of The Box. And the recipe was full-proof, you can see the end-result, taste was great. 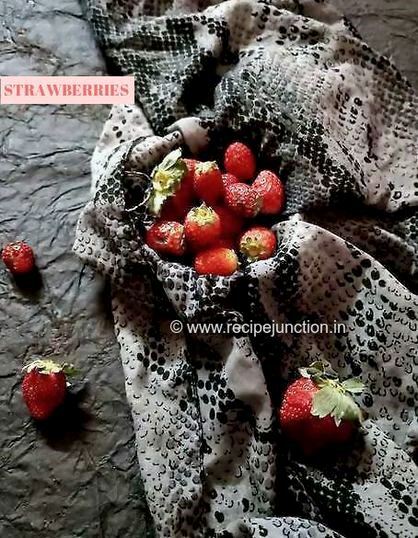 I totally followed her recipe, just added few chopped strawberries as my kids love them. 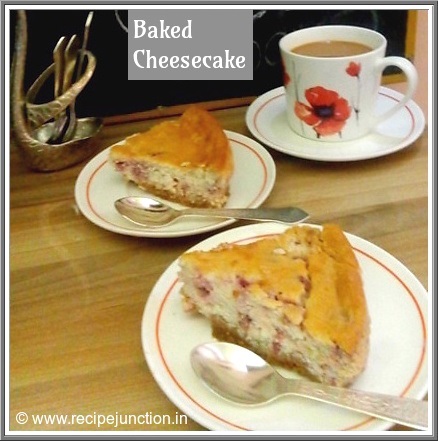 For more such recipes, visit her blog. 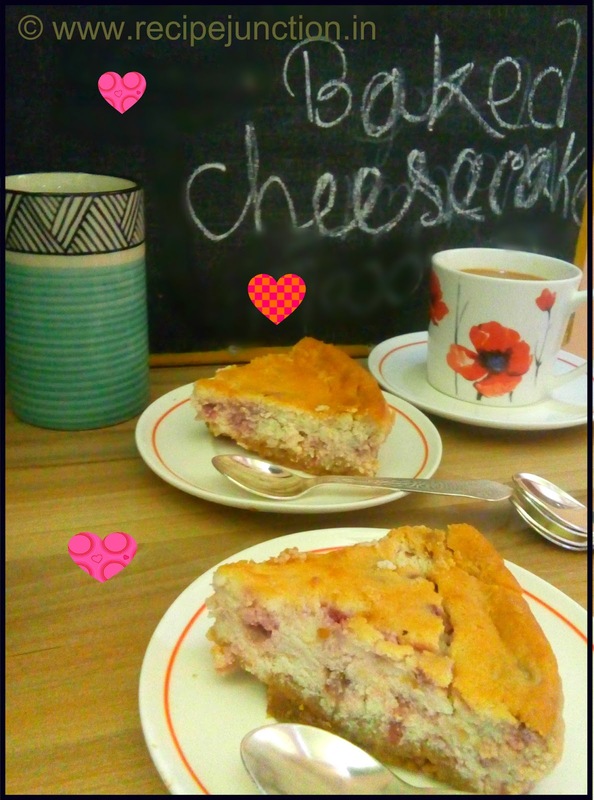 As Strawberries are in season, I've added fresh strawberries in the cheesecake. Glad that I've tried and became successful. I've prepared a no-bake mango cheesecake before and posted the recipe too. But never tried a baked one. I'll share the recipe today with you all. 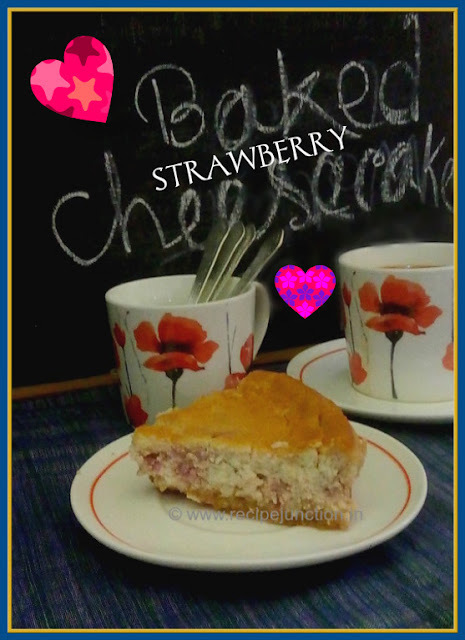 Prepare this on any special occasion like on Valentines day or birthday or just like that. Kids as well as adults will love this dessert. 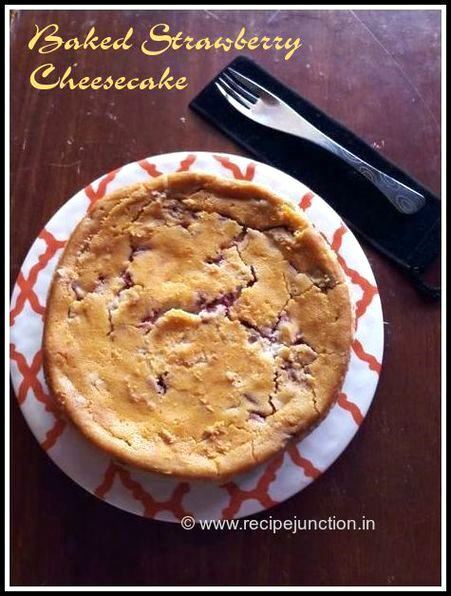 Because cheesecake is absolutely an addictive dessert. Cream cheese, softened- 150 gms. Preheat oven to 175 degree C. To make the base, grind cookies into fine powder in a mortar and pastel. Add enough melted butter into the grounded biscuit so that biscuits soak all the butter. Spread this mixture evenly on the base of a greased baking pan and with the back of a even bowl, tap allover the biscuit layer. Bake for 15 minutes and then keep aside to cool completely. Now for the cheesecake layer, take a bowl add softened cream cheese, sugar and yogurt. Mix until a smooth mixture forms. Use an electronic hand mixer for best result. Separate the egg yolks from egg whites. Add egg yolks one at a time and mix until well blended. Now whisk the egg whites separately until stiff. Add into the cream cheese mixture, mix well with a spatula. 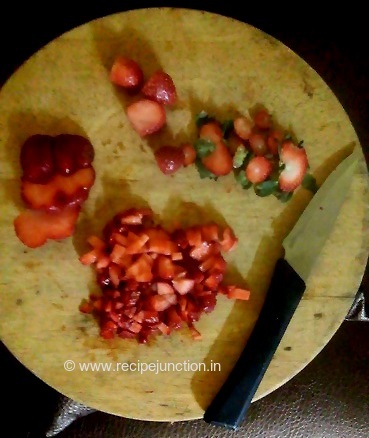 Lastly add finely chopped strawberries and give it a good mix. Pour this filling over the cooled biscuit base. Preheat oven to 160 degree C and bake for 50-60 minutes or till the edges of the cake turns golden brown but the center is still wobbling/jiggling. Now the main part, keep the oven door slightly open and don’t move the cake from the oven for 1 hour. After this, take out the cake, and keep outside until completely cooled. Then put the cake for the final setting in the fridge for minimum 4 hours or overnight before serving. Your Baked Cheesecake is ready to serve. You can serve this as it is like I did, or you can do some decoration for special occasions with fruits/choco ganache, or anything you fancy.